N/a’an ku sê, an organization that conserves and preserves the people and animals of Namibia through projects like an animal sanctuary, free health clinic, children’s school and the newly added nature reserve. Their digital marketing and communications manager, Leah Llach shared several tips and real-life examples on how to get the most out of seasonal online communications and how Google tools can help. We’ve shared a few of her insights below, but make sure to watch the Hangout to get the full story. Set goals. Work with your team to create written priorities for the holiday season. If you're working on several different projects, this helps everyone align on the mission and direction. Speak the same language. Internally, it can be as simple as naming conventions in spreadsheets and databases. For example, using the term ‘Animal Adoption’ instead of ‘Animal Adoptions’ can affect how your filters work and result in inaccurate data. Externally, keep your holiday messaging across your website, ads, emails and videos consistent. To learn more about these ideas and using Analytics, YouTube and Google Ad Grants to maximize your online communications, check out the full Hangout with Leah. And if you're interested in other ways to leverage online tools during giving season, continue to visit our Google+ page, Twitter and blog for more best practices tagged #givingseason. We’re always inspired by organizations who use technology in innovative ways to extend and communicate their impact. Recently, we sat down with one such nonprofit, N/a’an ku sê, an organization that conserves and preserves the people and animals of Namibia through projects like an animal sanctuary, free health clinic, children’s school and the newly added nature reserve. Their digital marketing and communications manager, Leah Llach shared several tips and real-life examples on how to get the most out of seasonal online communications and how Google tools can help. We’ve shared a few of her insights below, but make sure to watch the Hangout to get the full story. Google and Millward Brown Digital study, 76 percent of donors said they go online to research a nonprofit organization after recalling seeing an ad online. Google Ad Grants, the nonprofit edition of AdWords, allows you to reach those people with ads on Google.com. To help you create effective ads and keywords for the holiday giving season, we recently hung out with Google Ad Grants experts who shared the tips below. Highlight tangible impact and include a clear call-to-action in ad copy. Show users the effect their donation can have on your cause in your ad. If you’re a cat shelter, consider using language like “$30 = 1 vaccination for a cat in our shelter.” Then, tell users the next step with a call-to-action like “Donate now!” or “Volunteer today!”. Use multiple ad variations in each ad group. Experiment with different ad copy and messaging. AdWords will automatically optimize your ads for you by showing the ad that performs best more often. Create ad copy that is relevant to your keywords. If your ad group’s keywords are focused on holiday donations, create ads that clearly mention holiday donations. This will make your ads clearly relevant to users who see them when searching for terms related to your keywords. Consider using negative keywords. If you have keywords that are relevant to both your organization and other industries or topics, you can use negative keywords to block traffic that you don't want. For example, if you offer youth tutoring, you may want to add negative keywords like “college” and “adult”, so that people looking for help with college courses or adult education don’t see your ad. To learn more about adding negative keywords, check out this article. See what users are searching for when they click your ad with the AdWords Search Terms Report. You can see exactly what users who clicked on your ad searched for in Google through this report. This is great way to get ideas for new keywords to add to your account. Instructions on viewing this report are available here. If you’d like to learn more about using Google Ad Grants to spread the word about your nonprofit this giving season, watch the full Hangout here or check out our AdWords help resources. And if you’d like to learn more about using online tools to get the most out of giving season, continue to visit our Google+ page, Twitter and blog for more best practices tagged #givingseason. According to a Google and Millward Brown Digital study, 76 percent of donors said they go online to research a nonprofit organization after recalling seeing an ad online. Google Ad Grants, the nonprofit edition of AdWords, allows you to reach those people with ads on Google.com. To help you create effective ads and keywords for the holiday giving season, we recently hung out with Google Ad Grants experts who shared the tips below. a recent survey, we found that 80% of donors used online video to learn more about a nonprofit organization. And, 57% of donors made a donation after watching an online video. To make sure you’re getting the most of your video and YouTube experience, check out these resources to help you build and optimize your channel. Join the YouTube for Nonprofits program and create your own free YouTube brand channel. The first step in engaging donors on YouTube is building out your own brand channel to house your videos and connect with your online community. Visit the YouTube for Nonprofits site to join. Get started planning your YouTube campaign and sharing it with your community. Once you’ve created your channel, you’re ready to begin reaching your audience and gaining exposure by creating and sharing a YouTube campaign. Take a look at these three quick video lessons to help you get your first campaign off the ground. Optimize your videos and channel with best practices like adding Call-to-Action overlays and creating video playlists. Beyond having donors watch your videos, you can encourage them to action by adding Call-to-Action overlays that drive traffic to your website, petition or other relevant site. Or, if you’d like to engage users around a specific topic, curate several videos into a playlist around that content to fully inform your audience. To dive into more of these and other best practices, check out the entire Playbook for Good. If you’d like to learn more about using video and other online tools to get the most of out giving season, continue to visit our Google+ page, Twitter and blog for more best practices tagged #givingseason. As we continue to move into the heart of giving season, how are you reaching donors online? Video is a powerful tool that engages potential donors on the path to donation. In a recent survey, we found that 80% of donors used online video to learn more about a nonprofit organization. And, 57% of donors made a donation after watching an online video. To make sure you’re getting the most of your video and YouTube experience, check out these resources to help you build and optimize your channel. Alameda County Community Food Bank has been using Google Maps to help potential donors find out where they can donate non-perishable food items to help alleviate hunger in their community. Through this interactive map, donors can see which drop-off location is located closest to them, find out the hours they’re open, what types of donations are accepted and more. The Shanti Project assists breast cancer patients in coordinating all stages of their care between low-cost medical services, health education classes, emergency funds and nutritional support so they don't have to figure it all out alone. Shanti is using maps to help its donors visualize the need for the navigation services it offers to their patients. If these examples have given you inspiration for creating your own maps for donors, then we’ve got the perfect tool for you. Earlier this year, Google made it easier to create maps with the launch of Google Maps Engine Lite. With Google Maps Engine Lite, you do not need to be a trained cartographer or computer programmer to make your own beautiful, interactive map for your website. In a few simple steps, you can have a map displayed on your website that shows your donation centers, soup kitchens or volunteer locations. You can start by heading to Google Maps Engine Lite and logging in with your Google account. To add locations to your map, you can either search for and add them one-by-one, or you can upload a spreadsheet of your locations with relevant information. Google Maps Engine Lite will help you map those locations quickly. Next, you can choose from different icons and base map styles to make your map more readable and appealing to your donors. You can add and edit information about each location directly in the map as well, so it’s very easy to add more locations down the line, or remove locations you no longer use. Once you’re happy with your map, simply click the “Share” button to get a link or the folder icon to get the HTML embed code to put it on your website. You can find the detailed instructions to walk you through all these steps in our tutorial. To learn more about Alameda County Community Food Bank, Shanti and how to create maps with Google Maps Engine Lite, check out our Hangout on Air. Happy mapping! As giving season arrives, we know that many of you are thinking about how to communicate with your donors. Perhaps you’d like to let potential donors know where they can drop off their donations or you’d like to demonstrate where their monetary gifts go. To do this, we’ve seen more and more organizations opting to use visually compelling maps. Check out these stories on how other organizations are using Google Maps to effectively communicate with their donors and make the most of giving season! Nothing else is changing, just the name. We are rebranding to clarify what our program offers to nonprofits, which is in-kind advertising through Google AdWords, Google’s online advertising tool. We hope the new name will make it easier for nonprofits seeking in-kind advertising to find the Google Ad Grants program. If you haven’t taken advantage of the program already, visit our site to apply. Nonprofits receive up to $10,000 per month in AdWords advertising to promote their missions and initiatives via text ads on Google.com. Google Grants is changing our program name to Google Ad Grants. So, we're kicking off an occasional series full of tips to help you get the most out of giving season. We'll cover best practices to engage donors, strategies to increase donations online and offline and how to make sure your organization stays organized and efficient through the busy season. Check out our Google+ page, Twitter and blog for these tips and tricks tagged #givingseason. To get started, we're sharing insights from a new survey from Google and Millward Brown Digital about the digital path to donation. The team surveyed roughly 1,000 donors and analyzed their online behavior from October 2012 through March 2013. They also analyzed Google query data to uncover major trends in donor behavior online. Here’s a few key takeaways. If you want to explore more of the data from this study, check out our interactive databoard. We'll also be inviting the folks who conducted this research to share more about their findings and what nonprofits can do to take advantage in 2013. If you’re excited about a particular opportunity, make sure to visit us throughout the season as we discuss these ideas. Compete/Google Nonprofits Study, July 2013; RT1: Which of the following sources, if any, did you use to look for info on non-profit orgs? Compete/Google Nonprofits Study, July 2013; M5: Which of the following, if any, did you do on your mobile device while interacting with non-profit orgs? It allows you to reach relevant users within a 15-mile to 40-mile radius around your nonprofit. We are happy to announce the addition of AdWords Express to our current Google Grants offering in the US, UK, Canada and Australia. If you don’t have the time to manage your Google Grants AdWords account and you are a nonprofit serving in your local area, AdWords Express may be the right fit for your organization. Create an online ad quickly and easily. Attract more local users to your website or Google+ page. Minimal ongoing management necessary. AdWords Express runs and automatically optimizes your ads for you. Similar to AdWords, you can reach customers on desktop computers and mobile devices (such as smartphones and tablets). Review the effectiveness of your ads in your dashboard. You'll need a Google Grants account to get started with AdWords Express. If you already have a Google Grants account, you can sign up for AdWords Express by following the instructions here. If you're new to Google Grants, check out these instructions on how to apply for the program and get access to AdWords Express. In an effort to make local online advertising easier, Google launched AdWords Express in 2011 as a fast and simple way to start advertising online. AdWords Express is designed for low maintenance campaign setup and management. It allows you to reach relevant users within a 15-mile to 40-mile radius around your nonprofit. improve family literacy, support veterans as they transition out of homelessness, or help communities make information more accessible. Unfortunately, nonprofits often lack the resources to fully take advantage of technology to further their causes. Two years ago we partnered with Points of Light to address this problem. With the support of the Corporation for National and Community Service, we created HandsOn Tech, an initiative with a mission to develop the nonprofit sector’s ability to use technology to increase community resources and improve outcomes for low-income communities and families. Fueled by the passion and skills of AmeriCorps VISTA members, HandsOn Tech pairs U.S. nonprofits with individuals who are passionate about technology and looking to make a difference. Through this program VISTA members and skilled volunteers (including many Googlers) deliver training to poverty-focused nonprofits and work one-on-one with organizations to create individualized, comprehensive tech plans to help them achieve their social missions more efficiently and effectively. 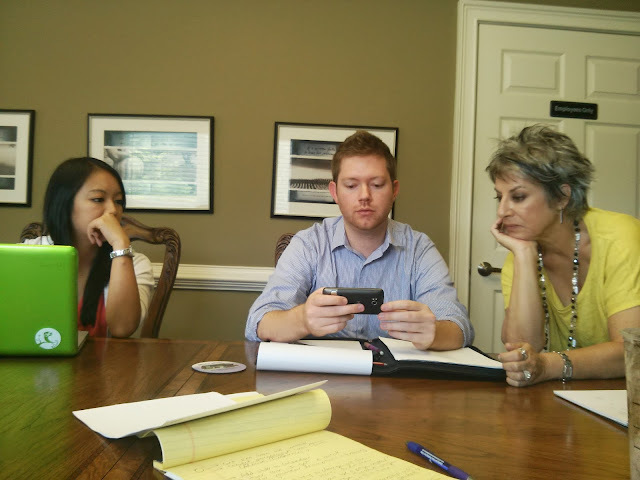 Stephenie Lai, a VISTA with HandsOn Tech Atlanta, looks on as skills-based volunteer Jon Whitaker demonstrates the new mobile version of the Cherokee Family Violence Center’s website to Meg Rogers, Executive Director. Click to see more photos. In the first two years of the program, VISTA members and skills-based volunteers have trained more than 7,700 nonprofit organizations in communities across the country. For example, VISTAs from a HandsOn Tech program in Pittsburgh worked with Naomi’s Place (an organization that provides transitional housing and supportive services to homeless women) to enhance their website, set up Google Apps, and develop a new Facebook page. The program also helps VISTA members and volunteers learn new skills. Alex Green, who served as a VISTA in Seattle, Wash., told us: "Apart from building awareness and ability in the community in terms of IT needs, I have also had the opportunity to grow myself as a person in all aspects of my life." HandsOn Tech Silicon Valley recruited skill-based volunteer Elyse Tager from Constant Contact to lead a training on how nonprofits can use social media to communicate their mission. Click to see more photos. 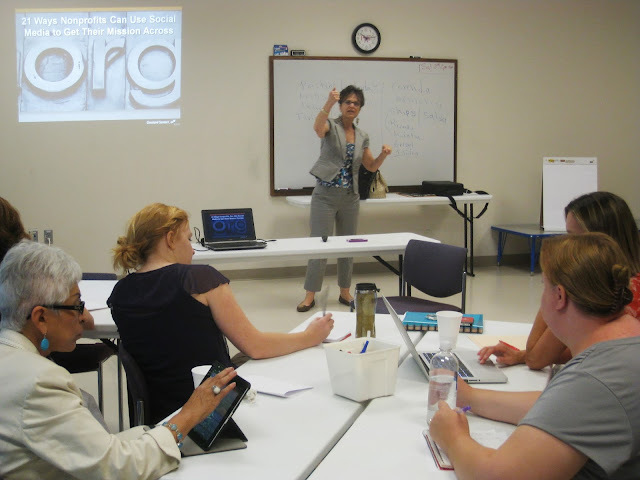 HandsOn Tech begins its third year this fall with programs in Atlanta, Boston, Chicago, Pittsburgh, San Jose, Seattle, Atlanta, Denver, Los Angeles, New York City and San Jose. Prior to beginning their service, VISTA members come together for a week of training at our campus in Mountain View, Calif., where they learn about cloud-based tools from a variety of technology companies including the Google for Nonprofits suite that provides nonprofits with access to premium versions of Google Apps, Google Earth and YouTube channels as well as free online advertising. A few openings still exist for VISTA members to begin serving in November in select cities. If you’re passionate about technology and helping nonprofits fight poverty, you can apply to join our team by August 31. With the right technology in place, nonprofits can do a lot to strengthen their communities and solve the world’s problems. They can help improve family literacy, support veterans as they transition out of homelessness, or help communities make information more accessible. Unfortunately, nonprofits often lack the resources to fully take advantage of technology to further their causes. The Google+ Nonprofit Guide, a compliment to our Partner Playbook, was designed specifically to share how you can use Google+ to hit your objectives and further your mission. Whether you want to grow your audience or develop a storytelling strategy, we’ve filled this guide with tools, best practices and real life examples from other organizations to get you there. To get started, check out our Google+ Partner Playbook and Google+ Nonprofit Guide. If you need some help using Google+, just +mention Google+ Help with your question. We can’t wait to see how you bring your G+ page to life! Google+ is a powerful tool that extends the reach of your organization. To help all types of groups get the most out of Google+, we launched the Partner Playbook last year. As nonprofits, we know you have a unique set of needs and goals. 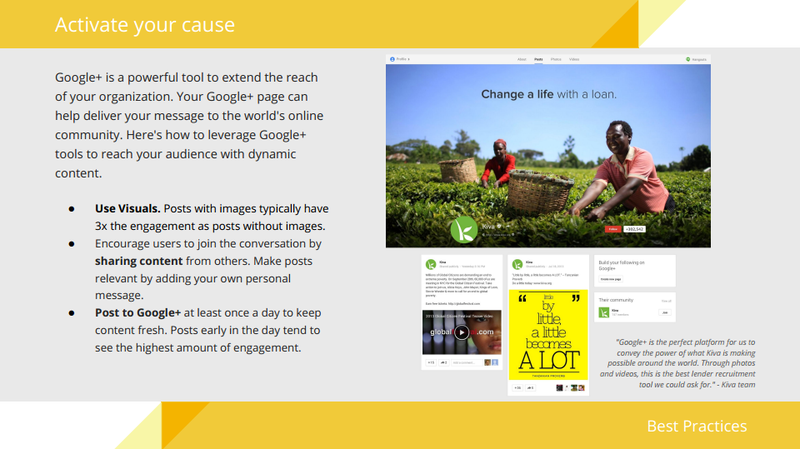 That’s why, we are happy to announce the launch of our Google+ Nonprofit Guide. On the eve of India’s independence day, we’re celebrating the spirit of creativity and entrepreneurship of the world’s largest democracy by spotlighting the best local nonprofits that are using technology to make the world better. Today we’re launching the Google Impact Challenge in India, inviting Indian nonprofits to tell us how they’d use technology to improve people’s lives. At the end of the challenge, four nonprofits will each receive a Rs 3 crore (around $500,000) Global Impact Award and technical assistance from Google to bring their projects to life. Get started on your application today: registered Indian nonprofits can apply online until September 5 at g.co/indiachallenge. 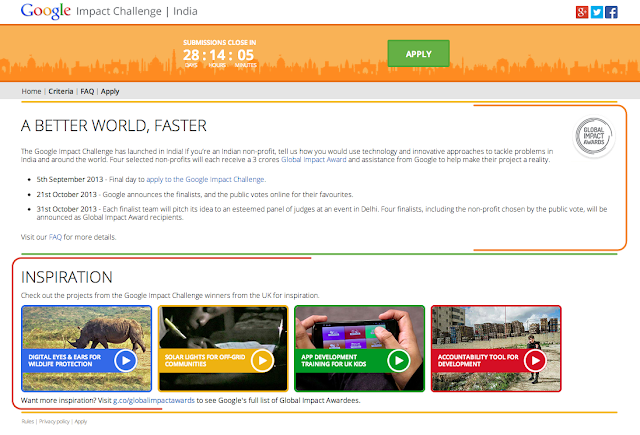 Googlers from India, and around the world, will review applications and announce the 10 best projects on October 21. You can learn more about the top 10 finalists then, and cast a vote for who you think should receive the Fan Favorite award. On October 31, I’ll join Ram Shriram, Jacquelline Fuller, Anu Aga and Jayant Sinha in Delhi to hear the 10 finalists pitch live. As judges, we’ll select three awardees based on their potential impact, scalability and ingenuity. We’ll also announce the winner of the Fan Favorite, according to your vote. Growing up in India, I’ve seen firsthand the vibrancy and innovativeness of India’s social entrepreneurs. I’m excited to see their projects and support their ideas for how to use technology and Rs 3 crores to change the world. One Today -- a mobile app that brings together people and nonprofits through the act of giving $1. Until now, One Today has been available through limited pilot, but now we are excited to announce that the app is available to all Android users in the US. With One Today, we connect users with the causes most likely to interest them by highlighting projects from different nonprofits like yours. Users can donate $1 to projects they like and a few dollars become many as users invite their friends to donate through social media. The more people who donate, the faster your project gets funded. Each month, nonprofits on One Today receive project donations through our partner Network for Good. Creating projects with One Today only requires about ten minutes of planning. By enrolling, you can expand your donor base and raise awareness about the amazing things you do. Signing up for One Today is completely free. To register, you must be a member of Google for Nonprofits -- if you are already a member, you can enroll by signing into your account and activating One Today. Here are more resources to get started with creating a project. We’re amazed by the great work nonprofits do on a daily basis to make the world a better place, and we’re thrilled to provide a new platform which helps you to tell your story to users who care about the same important things that you do. We look forward to continuing to improve the One Today experience and to growing our dynamic community with incredible nonprofits. Back in April, we launched One Today -- a mobile app that brings together people and nonprofits through the act of giving $1. Until now, One Today has been available through limited pilot, but now we are excited to announce that the app is available to all Android users in the US.